A while back, The London Times released the results of a study indicating that kids who play music video games like Guitar Hero and Rock Band may take up the hard stuff --namely real musical instruments. "We have long known that young people are encouraged to take an interest in music if it is presented to them in a compelling way," said Andrew Missingham, the music industry expert who wrote the report. "This research for the first time shows conclusively that young people are being inspired to make their own music by games that first piqued their interest." The results aren't any surprise to anyone who has observed kids playing these games. I've seen my nephew go from Guitar Hero to Rock Band and now he's playing a full-size Strat. 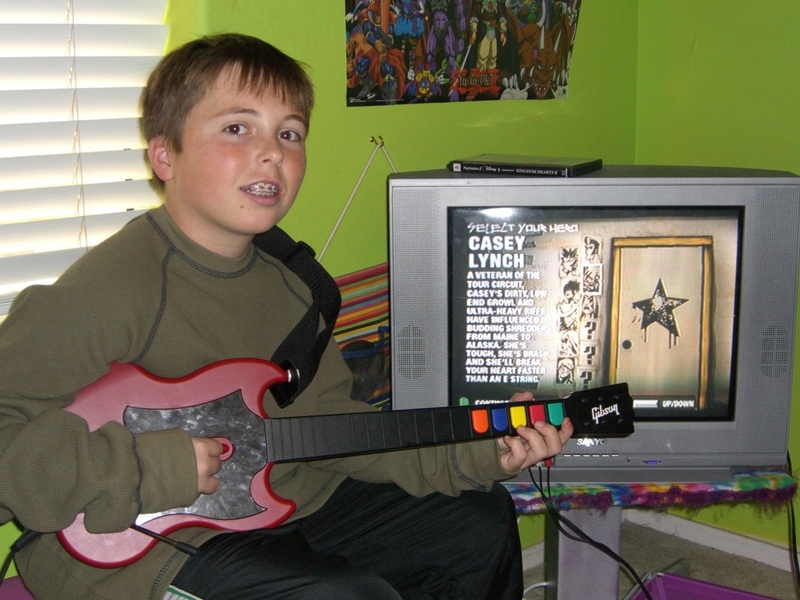 While he was always interested rock music, it wasn't until he started playing the games that he developed an interest in playing music. While these games are no substitute for real musical instruments, they do help develop basic hand-eye coordination and rhythm --both in kids and in adults. So go ahead, break out the Rock Band game with the kids. Not only is it fun, but it might just develop their interest in playing music. Lets see where this leads to in a few years. We might just see a classic rock revival. With last week's release of The Beatles: Rock Band and newly remastered CDs, it was Beatlemania all over again. While you still can't get The Beatles catalog on iTunes, I suspect even that will happen sometime in the next year. Or more likely, the week after I buy the last of the new CDs. It's a good article and certainly whet my appetite for the game, as did a follow up article in Wired. For boomers, old-time Beatles fans who have Rock Band, it's a no-brainer. But it's not cheap. The game starts at around $60 (software only) and can cost up to $240 for the full-deal plastic replica Beatle style instruments. (And as has been pointed out, you can certainly buy a decent real guitar or bass for that price.) Still, when you listen to some of the classic Beatles songs it's not hard to see why their music touches people. I don't think there's been a song-writing team to compare that compares to the Beatles in 40 years. So if more kids get exposed to the Beatles music, that's not a bad thing. If some of them then get inspired to pick up guitar, bass or drums, even better. For those who've had just too much of all the recent Beatles hype, here's a spoof video on Guitar Hero Beatles edition. And to be clear, yes, I've put in my order on Amazon. I'm looking forward to it. Beatles Rock Band - Too Little too Late? While the folks over at MTV have recently announced the launch date of their newest Rock Band edition featuring The Beatles, some folks are already griping that this may be too little too late. Rumors about the game surfaced last October and it looks like the game won't be available until September 9, 2009. While that's a long time from now, it's still in advance of the holiday buying season. Personally, I'm not sure that The Beatles music will really be a good fit for this type of interactive medium. The Beatles were a huge impact on modern pop rock music, but I'm not sure how much appeal the beatles have to the traditional 12-25 year old gaming set. Even Seargent Peppers is long past the "20 years ago today" date. Still there are enough longtime Beatle fans that may want to pick it up to introduce the music to their, ah, grandkids. Lets see what the setlist includes. 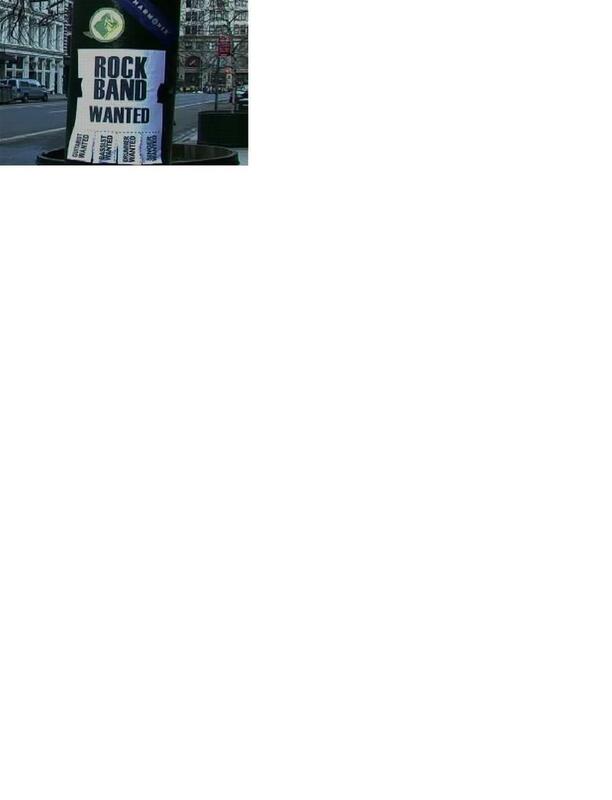 Personally, I'd be happy to with songs like: Revolution, Paperback Writer, Back in the USSR and anything from Abbey Road. But if rhythm video games like Guitar Hero and Rockband are going to stay relevent they're going to need to get a bit more hip to music. Packages featuring Aerosmith, AC/DC and Metallica are a good start, but where's the Who at King Dome, Kiss at the Colliseum? Where is the U2 of our generation? MTV.com: Which Beatles Songs Do You Want to Play? CNet: Is the Beatles Rock Band Game Too Late? 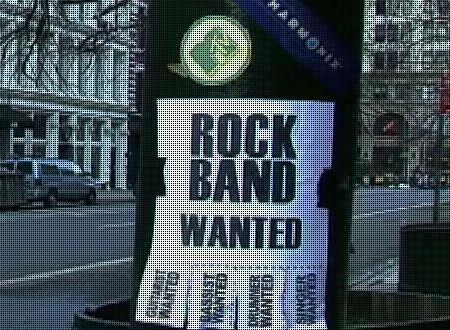 Still counting the days until Guitar Hero III or rival Rockband appears in time for Christmas? 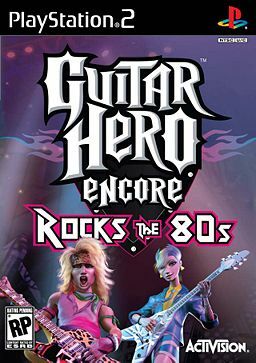 Then check out Guitar Hero Encore: Rock the 80s. It's a bit pricey at $50 for 30 new songs, but if you want to rock out to hits from your youth, it's a must have. The song list includes: We Got the Beat, I Ran (So Far Away), Radar Love, Turning Japanese, What I like About You, Synchronicity II, Ballroom Blitz, Lonely is the Night, Heat of the Moment as well as tunes from Poison, Anthrax, Twisted Sister and Judas Priest. However, some of the songs are really more keyboard oriented than riff rock anthems. I don't think anyone ever air guitared to Flock of Seagulls before. So get out the spandex, put on some hairspray and rock like you never did before. Available for Playstation 2 only. Though I would guess these songs will end up on XBox Live for download at some point. Note also: Guitar Hero III will be coming out for the PC and Mac this fall. Rock Band, an upcoming computer video game by Harmonix, the original developers of Guitar Hero, will feature Fender guitars along with Roland and Boss gear. The game aims to one up Guitar Hero by enabling multiple players to interact online with virtual drums, bass, guitar and vocals to jam in real time to a wide range of rock music. Harmonix, now part of MTV, has announced the game will be distributed by Electronic Arts on Xbox 360 and Sony Playstation 3 platforms in time for the 2007 Christmas season. If it's anywhere near as good as Guitar Hero, it will likely appeal to a huge audience of gamers and rockers alike. Nailing a guitar solo in a video game is not quite as challenging as the real thing, but it's a heckuva a lot of fun. 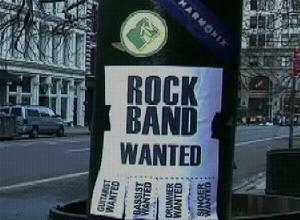 Update: A good article describing the appeal of Rock Band is available in Gaming Today. Also news about the Guitar Hero III track list which includes songs by the Stones, Kiss, Alice Cooper and Foghat among others. 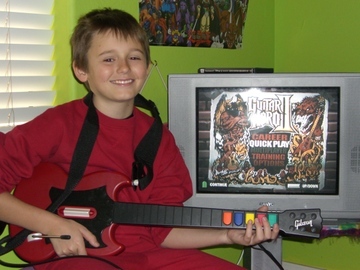 Guitar Hero II, from Red Octane, is the much heralded sequel to their award-winning air guitar game Guitar Hero released in 2005. Guitar Hero built up a rabid following among gamers, guitar players and oddly enough, rock stars. 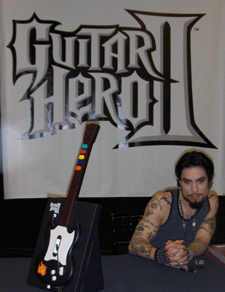 Even if you're decidely not into video games, if you play guitar you should check out Guitar Hero. The idea is that you use a plastic guitar-shaped controlled to hit the right notes to classic rock songs by clicking on colored fret buttons and struming in time. While that doesn't sound like much, the game is surprisingly addictive, especially as you play classic rock songs from Cheap Trick, The Police, Kiss and many others. If you hit the right notes, you'll hear a roaring guitar solo and cheers from the audience. Hit the wrong notes and you'll hear a humbling "plunk" sound and likely get booed off stage. As you improve, you can play bigger venues, harder songs, buy new gear, and presumably, end up on VH-1 Behind the Music. 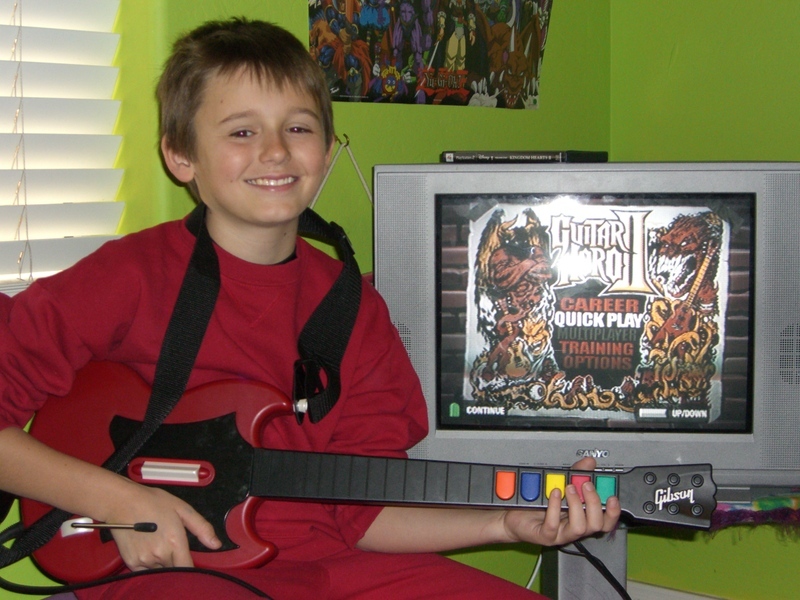 Right now, Guitar Hero and Guitar Hero II run only on the Nintendo Playstation. But new versions for the XBox 360 and Nintendo Wii are expected in the coming months as well as a package of 1980's hits. For a more serious discussion of Guitar Hero and its impact on the industry, read the guest column over at OnDisruption. I'm seriously considering buying Guitar Hero to make up for my spastic lack of rhythm. The game turned out to be a big hit this Christmas with my nephews shown below who had no such problems.